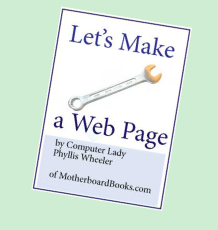 Next up on the TOS review list for us is an e-book from Motherboard Books, called Let’s Make a Web page. It is intended to be used with children ages 8-12. My 11 year old daughter is who got to review it. If you didn’t figure it out from the title, I will tell you… this e-book teaches your child how to make a web page! It takes them step by step through the process. And when I say step by step, I really mean it! This is my favorite aspect of the book! It does not assume you know anything. Which, I suppose some might find annoying, but if you already know how to do something, then skip to where it’s something new. I have not allowed a whole lot of freedom when it comes to computer usage in our house, so our kids are not the most computer literate. They can enter in website addresses and navigate the sites they are familiar with, but they are not familiar with word, finding photos, etc.. I was a little worried that would have an effect on how she was able to use this book, but it was not a problem at all. The book was so specific in it’s instructions, that she was able to follow along just fine. She learned so much about how to use a computer by going through this book. Besides the obvious result of learning how to make a simple web page, she learned about changing colors on pages, uploading photos, typing in notepad and so much more! The premise of the web page is an interview with someone of the students’ choosing. My daughter chose to interview her 5 year old sister. She said the interview was harder than she anticipated, because her sister wouldn’t answer the questions very clearly. That was good, though, because it taught both of them to communicate a little better. It ended up being a very cute interview!